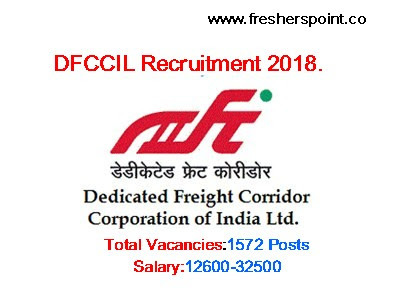 Dedicated Freight Corridor Corporation of India (DFCCIL), is a schedule 'A' PublicSector Undertaking under the administrative control of Government of India (Ministry of Railways). It is the most ambitious and one of the biggest project in the infrastructure sector, set-up to build high capacity and high-speed rail freight corridors along the golden quadrilateral and its diagonals. The first Phase comprises of construction of two dedicated freight corridors spanning Ludhiana-Delhi-Kolkata (Eastern DFC) and Mumbai-Delhi (Western DFC). At present, the company has its Corporate Office at New Delhi and Field Units at Ambala, Meerut, Tundla(Agra), Allahabad(East & West), Mughalsarai, Kolkata, Mumbai (North & South), Ahmedabad, Vadodara, Ajmer, Jaipur, and NOIDA. Candidates are advised to read instructions carefully before applying online and also all the instructions are given on main instruction page by visiting the DFCCIL website and going to the tab "CAREER" on DFCCIL website: www.dfccil.gov.in. No other means/mode of submission of applications will be accepted under any circumstances.